Taking Back Sunday have announced that former Underoath frontman Spencer Chamberlain will fill in for Adam Lazzara for the remainder of the band's fall tour. A statement from TBS can be found below. 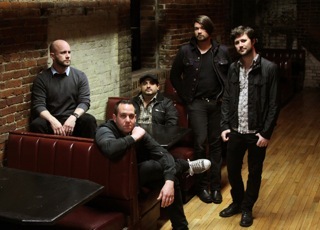 Taking Back Sunday announced today that they will resume their fall tour with the help of former Underoath frontman, Spencer Chamberlain. Spencer will fill in for lead singer Adam Lazzara on an indefinite amount of upcoming tour dates starting with the Melbourne, FL show this Friday, October 25th. This comes after Adam Lazzara had to leave the tour on Sunday when his wife unexpectedly had an early delivery of their second son. After cancelling a few tour dates, the band has decided to continue the tour with Spencer Chamberlain until Adam can rejoin. Spencer Chamberlain, a long-time friend of Adam, has willingly stepped up to fill in and give the new father more time to stay in the hospital with his family. Spencer was the frontman of Underoath for 10 years and is currently working on a new project called Sleepwave. The band is excited to have him and look forward to Spencer and John trading lead and backing vocals at the upcoming shows. First up will be the Free FIT Homecoming show this Friday in Spencer’s home state of Florida. You can find more information on Sleepwave at http://www.sleepwavemusic.com. It is unknown when Adam will return to the tour, but he is so thankful to Spencer and whole-heartedly thanks everyone for all of the support and kind words the family has received.